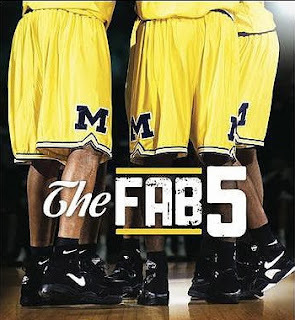 The Fab Five was the nickname for the 1991 University of Michigan's men's basketball team recruiting class that is considered by many to be the greatest class ever recruited. Well, move over Michigan, because Elk Grove has its very own Fab Five, and this team, with its full court press may very well slam dunk their way to a political dynasty. Our Fab Five have just laid out a magnificent tax and spend plan that will surely put them into the City Council Hall of Fame, or the Hall of Shame--we're just not sure which one yet. As we are all aware, the Fab Five have laid out an ambitious plan to build and operate several sports facilities and other civic amenities that the private sector will not touch with a ten foot pole. By sinking their marbles (our budget) into a soccer stadium, aquatic center, civic center, animal shelter, veterans hall, and downtown plaza, they are betting the farm that these facilities will not turn into boondoggles of massive proportion. But before we write this All-star team off as crackpots, let's analyze where most of the funding sources will come from. The great philosopher Voltaire is quoted as saying, "In general, the art of government consists in taking as much money as possible from one party of the citizens to give to the other". Well, the Fab Five have artfully devised a no-lose tax scheme that ensures these and any other future sports and recreation facilities will be paid for by each property owner forever-I mean forever. Forget what you may have heard about Prop 13 locking in your property taxes, for we now have Community Facilities Districts (CFD) in Elk Grove that will neither expire nor be capped in any way. CFD 2006-1 is one glaring example of a CFD that is essentially a blank check given to the Fab Five and their successors. This particular CFD requires an annual tax assessment to pay for all current and any future city sports and recreation facilities as they are dreamt up. The amount you pay is also subject to periodic adjustment as the inflationary costs go up. Now if that isn't a blank check, what is? Laguna Ridge residents have been paying their own version of this CFD for the civic center for years, and the city has already collected $31.5 million in funds so far. Thank you for your patriotic service! Now, you may be wondering how did all these sports and recreation ideas ever get cooked up in the first place? Well, at the risk of being over simplistic, it all started with members of the Fab Five wanting to put Elk Grove on the destination map for the region, the allure of sales tax revenue, and of course votes. I recall swim parents and their children packing the city council chambers on the night that pursuing a high dive and olympic pool was approved. Never mind that the commercial water park was supposed to help subsidize the facility and no one in the private sector bit on that carrot. Then there were the soccer parents and their kids all decked out in their uniforms rooting for a competition stadium for tournaments. Never mind that the Fab Five unsuccessfully tried to land a professional MLS team at that same stadium, and Mayor Kevin Johnson was called out by Mayor Davis as being a "ball hog" for trying to successfully do the same thing. So as our all-star class moves forward, we have three members up for election this year. But make no mistake about it-these five are sticking together because they are not going to let a newcomer share in their glory of seeing these dream projects come online. The Fab Five may very well see their busts cast in bronze...well, at least their names printed on a bronze plaque at each of these facilities and the taxpayers will enjoy the personal rewards of being a destination city. Before we get all giddy and crack open the champagne, let's look at some realistic pitfalls that may endear our Fab Five directly into the Hall of Shame. First, we are being led down a path where we will get the blame for some of these projects failing if we reject a sales tax increase. That's right, make us the scapegoat for sinking these projects and the Fab Five will still come out smelling like a rose. Then there are those pesky CFD assessments that are virtually hidden taxes that most residents are unaware of unless they read the voluminous disclosure documents offered to them when they bought their home. Then, how many people dissect their monthly impound account payments or note where the bank automatically makes the tax payments? Each home has on average 5-8 different CFD assessments, half of which are uncapped and will last forever. There will come a day when property owners and potential buyers in Elk Grove become painfully aware of these assessments and the cost of living in Elk Grove. Finally, these dream projects will require ongoing growth and development (and the CFD payments of course) to pay for these projects the Fab Five plan to build. The rate at which Elk Grove will grow in the future is entirely based on the regional market and job growth. Delta Shores, Cordova Hills, Folsom, Lincoln, and Natomas may have something to say in this matter. Might want to check their CFDs too! So if you feel you are trying to run up and down the basketball court of everyday life in Elk Grove, it would be understandable if you feel that our Fab Five have a full court press on you. Their projects make for good sound bites and will score political points, but you the taxpayer will be left holding the bag. In the memory of the great Harlem Globetrotter, Meadowlark Lemon, don't let them pull the famous clown prank where they sneak up behind you, and in this case instead of pulling down your shorts, they pickpocket you and run away with your wallet! No one knows what's happening here because they don't pay attention, just what the Fab 5 are counting on. They may realize they've been taken advantage of when their tax bills arrive, but the Fab 5 are hoping that will be after the next election cycle. Maybe someday these citizens will wake up and hold the electeds up to the scrutiny they deserve. Until then, time to open all of our wallets...and for those of you south of EG Blvd and west of 99 you may have to take out an equity loan to pay your taxes. The Fab 5 say they will work with the CSD and EGUSD, but both have shown no interest in becoming part of this boondoggle. It will be interesting to see how close the RFP's are to the cities estimates. When you lay your cards on the table for all to see you have in effect left the door wide open. Something our city hasn't learned after all these years. They've already said that any shortfall will be handled with slapping a CFD, that is not capped, on the Laguna Ridge taxpayers. That $10 million dollar bond fund they spoke of could easily become a $15 million dollar bond fund. I keep reading about the Animal Shelter on the blogs and where they're seeking volunteers, asking the businesses for help and more. Some seem to think this 1/2 cent sale tax the city is talking about will build this shelter...that's a sound bite the council throws out to the residents. Does that mean the $8 million dollar short fall for road maintenance takes second place? Since we're not hearing anything from the Laguna Ridge taxpayers at the council meetings, which gives me the impression they have no fight in this placing of Bonds on their tax rolls, why not just place another Bond on their area for the Animal Shelter? Gotta be some land available and would be close by outlet shopping & the sports haven. Interestingly, there was absolutely no acknowledgement or discussion during the city's, the consultant's or the council's presentations of the construction currently underway of the Southgate Recreation and Parks District Aquatics Center located within the EGUSD borders and just north of the city limits on Waterman Road. This facility will have a 10 lane competitive pool and is also designed for recreational and swim lesson programs. Was the consultant made aware of this facility, or for that matter, the Wackford Center, when they prepared their monetary projections for estimated revenue? Since neither facility was ever mentioned during the entire discussion at the council meeting, I'm going to assume that this information wasn't shared. With two other competing facilities, the EG Aquatics Center may find the revenue projections are way off thereby necessitating further increased Mello Roos tax applications, applications that run forever and have no cap. Certainly revenue projections could be substantially different if the consultant was made aware of these facilities. Someone needs to drop a dime on the consultant to confirm whether or not they were fully informed. I too noticed that when reading the Agenda and during councils discussions...not one word about the Southgate facilities. This has been brought up at previous meetings and not one councilperson had heard about it, or so they say! That could certainly have a hugh bearing on the projections presented by the consultant. I will never understand why our city can never seem to get it right...open and honest. Residents no longer feel welcome at the Peoples House and that is what works in their favor....just the way they like it. Yes, we do our duty and go to the polls to vote. Just ignore voting for any of the council members, which is sad to say the least. Hopefully we'll have some choices this year.